are the best ones. And sometimes they need a little something in the midst of pattern writing and commission stuff and new job. 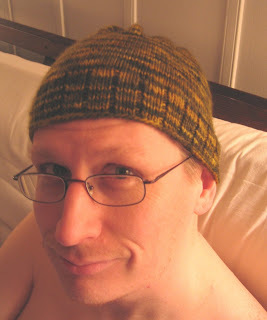 Chris in new beanie hat. 1 skein Malabrigio on size 3 needles. First big lace. SOOO BEEEEG! 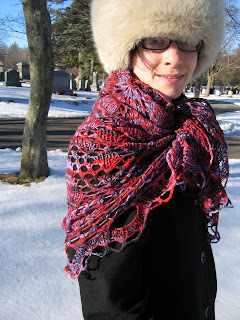 Here it is, the Daria shawl from Knitpicks. I CAN'T WAIT TO DO MORE LACE!!! 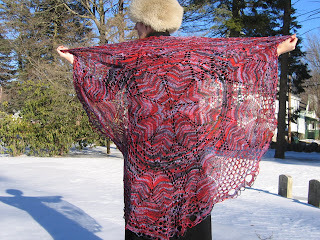 Warning: this shawl takes nearly FIVE skeins of Gossamer, doubled, not TWO, as the pattern specifies. There was a lot of cursing, and reordering, and waiting, and restarting... fortunately the yarn is varregated, so I didn't need to worry about dye lots. On this, my penultimate day as someone who doesn't really work (since I just can't firmly place what I've been doing for the past two weeks, occupying a physical location for a predetermined period of time for a small monetary reward, solidly in the category of "work"), I spent much of the day looking at the website above and figuring out an order that would fit both my limited budget and my need to experiment with new fibers and develop more of my own ideas. Our trip to Germany in the summer of 2008 will be possible with my new job. It's a tradeoff... less knitting, less reading, less Maury at noon with a giant pot of coffee, but more paycheck, cheaper health insurance, more paid vacation that will begin to accumulate. 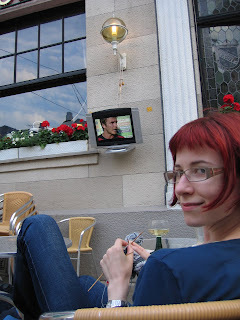 Until then, fond memories of outdoor sock knitting, Rhein wine, and the 2006 Weltmeisterschaft in Boppard, Germany! PS. 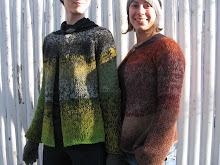 Photos of new finished knitting to be posted Saturday, when we are at the house when it is actually light outside! I've got hat for you right here, Dr. Wheels! This receptionist gig has provided the perfect environment in which to read 100 pages a day, surf the internet, read the Times and the Globe, and knit a hat in a day and a half. 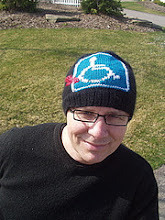 Expect hat in the next Big Box of Knitting Products coming your way, early next week. 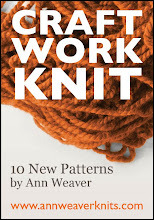 Exciting news-- the first pattern we've written up will be published in the MagKnits May issue! 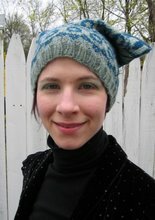 Free patterns, yup, fantastic stuff. 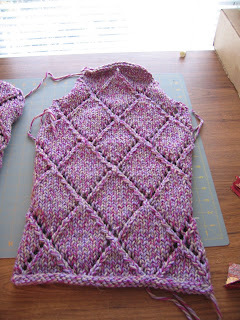 On the right is a photo of Rowan Plaid, a sleeve for the pullover Tidal Wave in the Plaid Collection book. Even though I though Plaid looked hideous in the ball, I took a chance and purchased a bag of it on sale after seeing a garment knit from it. I believe it is called a "marled yarn," which in itself is unattractive (we have family friends with a cottage that sits on the shore of a "marl-bottomed lake." Marl is a quicksand-like slimy, gritty mud). The finished product, however, looks fantastic, I think. I have both sleeves and the back done and should have a finished sweater next week. 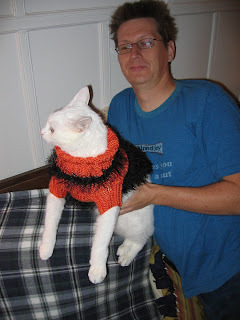 The other day my sister sent me this photo, with the subject line "Ideas for Knitwear." It's not meant for a cat. It's meant for a tiny, tiny dog, that kind that's fashionable. It was commissioned by my former boss. Only I never got paid for it. 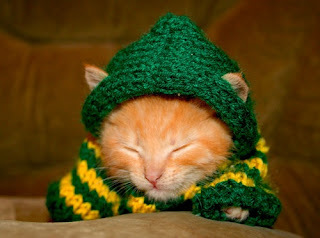 Yes, that is fun fur. Yes. I made that. Wonder why I don't work there anymore? It's been busy here... a gig as a receptionist for 2 weeks, and some projects that I can't show right now. One of them will be arriving at my parents' house in a few days, and I don't want to ruin the surprise. The other is a design collaboration with my sister and a lot of slippery, synthetic yarn that I would never choose on my own... that's the beauty of working with someone with a different eye. 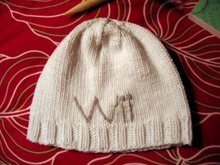 The piece is LOVELY and the yarn is perfect. Until then, here's a shot of what was clogging the vacuum cleaner. 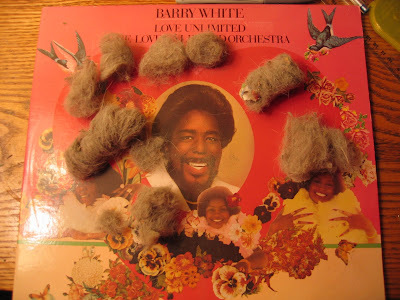 On a Barry White album. It just looks right. 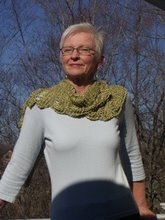 The Sea Silk Clapotis is completed, washed, and blocked, and has been worn to temp jobs with much positive feedback. It is lovely. It is elegant. And the Sea Silk is remarkably durable! 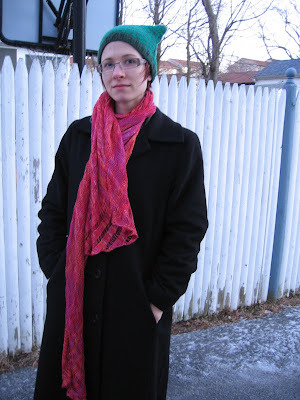 I experienced one snag the first day I wore it, and it was simple to even out the tension in the snagged row with no lasting damage to the yarn! Another Sea Silk shawl, probably of my own design, is in the near future. Most likely a gift. Or a commission if I design something. I will not get away with wearing this much without getting at least one request. The specifics: 1.5 skeins of Sea Silk in "Sangria." THIS IS SO COOL!!!! OH MY GOD THIS IS SO COOL! 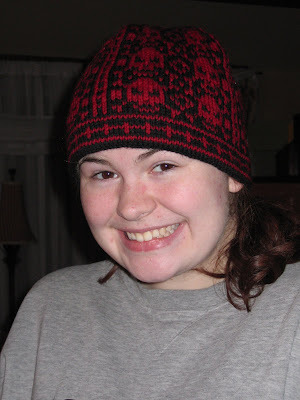 It's made with Cascade 220; I got perfect gauge of 5 st/in with size 3 needles. The lining is Knit Picks Ambrosia. There's enough left for a second identical hat for Dad. lets the mind wander where it will, and, with the right attitude, fosters creativity. Between interviews and applications and such, the following original projects came about. 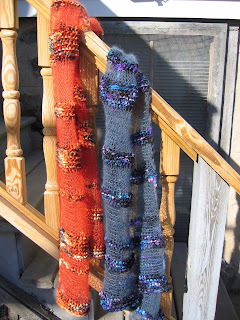 To the left, a photo of two what I've named "Tripe" shawls hanging from our railing. Yarns: Rowan Kidsilk Haze, 1 skein, and Colinette Tagliatelli, 1 skein. On the left, "Marmalade" and "Sahara," on the right, "Hurricane" and "Kingfisher." Both were commissioned by my mom, after seeing the original version I created for Beth for Christmas. 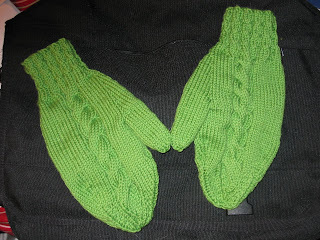 Bartering for goods and services when one has no steady income is productive: witness the "Kay" mittens, knit in exchange for an hour-long massage. Only 1 ball of Cascade 220 Superwash in Kay's favorite color and a couple hours of knitting produced lovely, leaf-like results in Kay's favorite color. 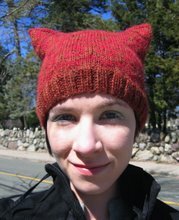 I can write up a pattern if there's any interest. Over the next week I anticipate some Friday Harbor socks from "Knitting on the Road" for another recipient, as well as a completed Sea Silk Clapotis for myself. 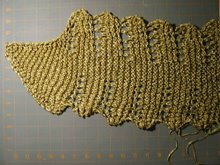 I haven't seen one in Sea Silk posted anywhere; I recommend the yarn for the sheen and drape, but not for the fact that its slippiness forced me to proceed very, very carefully to avoid dropped stitches. This makes such a big boring project much, much more time-consuming. 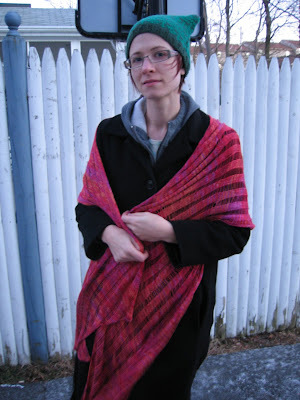 Would I make another Clapotis again? Yes. In Sea Silk? Not for a year or two.